After the Civil War, the U.S. Navy had deteriorated. For 20 years, its strength was negligible. The few remaining Civil War era ironclads did not have the range to project power beyond the coast. The Virginius Affair in 1873, showed that the navy couldn’t even defend New York Harbor! In 1883, Congress authorized 3 modern warships. These were small Cruisers. The U.S. Navy remained essentially helpless. Not until 1895 did the first “Battleships” join the fleet. These were the Texas and the Maine. These very odd ships had their main turrets on the sides of the ships. Neither ship could turret their all their main guns around to fire a broadside. They were first designated as Cruisers and only later “Second Class Battleships”. At least they were larger than the Cruisers. That year saw the first true Battleship, the Indiana. This was also procured as a class, thus saving the cost of designing and building from the drawing boards on subsequent vessels. The Massachusetts and the Oregon followed in 1896. These ships carried four 13 inch guns and two turrets (two guns per turret, one turret in front and one in back). The still primitive design lacked counter-weights, so that when the guns were swung to one side or the other, the ship listed on that side. The ships also carried smaller guns which were mounted on the side like the sailing Ships of the Line of old. The bow was reinforced to use as a battering ram. Also, the ships were under-powered with the idea that they would be used for coast defense, only. To remedy some of these defects, the Iowa was commissioned in 1897. The engines were improved, the hull size was increased, armor improved, and four turrets added with two 8 inch guns per turret. With the additions to the secondary armament, the size of the four primary guns was reduced an inch to twelve. So, by 1898, the start of the year the Spanish-American War began, the U.S. Navy had two weak Battleships (Texas and Maine), three slow short-range Battleships (Indiana, Massachusetts, and Oregon) and one decent Battleship (Iowa). The Maine blew up and sunk in Havana Harbor, precipitating the war. Of the remaining five, all but the Massachusetts fought in the main Atlantic battle, the Battle of Santiago later that year. The Massachusetts was patrolling the area but missed the battle. 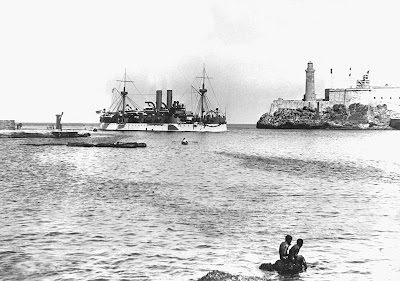 Picture: USS Maine steams into Havana Harbor, January, 1898. It will blow up 3 weeks later, instigating the Spanish-American War. More information: US Naval History, List of Battleships.